Please present coupon upon ordering. 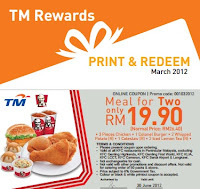 Valid at all KFC restaurants in Peninsular Malaysia, excluding KFC Genting Highlands, KFC Genting First World, KFC KLIA, KFC LCCT, KFC Cameron, KFC Senai Airport & Langkawi. Not valid with other promotions and discount offers. Not valid for catering order of 50 packs & above. Colour or black & white printout coupon is accepted. Share this great deal with your friends yeah! 28 March'12 10pm KFC Kulai Town hesitate to allow purchase with this coupon. Many excuses, say HQ stopped this & that. The manager looked upset when I insist. Eventhough I got it, she certainly is the spoiler.